Home » Meat » Beef » Crock-Pot Smoked Beef – First Try! This has been a LONG TIME COMING! I first stumbled on this a while back, and wrote about it. I accidentally left a pork-roast in the slow cooker all day without any of the normal water-adding ingredients to help it cook properly. I came home, smelled the smoke, and immediately realized what I had done. Fearing the worst, I looked in to my slow cooker to find a wonderful gift waiting for me! It turns out, I did leave something in the slow cooker to mitigate the direct heat on the pork roast: I left Beef Short Rib bones, which I had expected to add their valuable nutrition content to the stewing process. 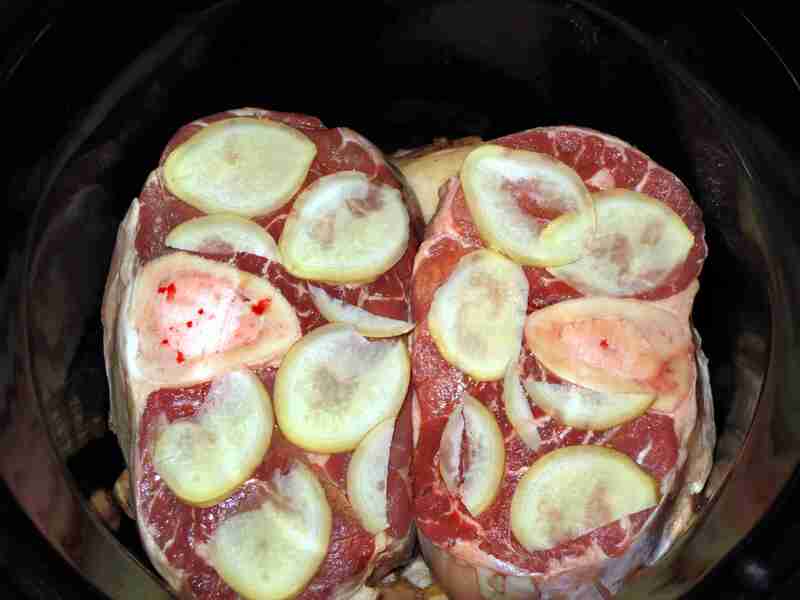 Instead, they crisped slowly, giving off a slow-burn of smoke and water vapor to “smoke” the pork roast. And it was amazing! I inadvertently did it again a week ago when I left the kitchen to make a “quick update” to one of my posts while cooking. I had a handful of carrots underneath some steak, cooking on a low temperature. Well, my “quick update” ended up taking more than an hour, and I completely forgot about the food! I know, it’s embarrassing… But even Chefs make mistakes! Trust me when I say: we don’t get every recipe right every time. We just have the dedication, perseverance, and passion to keep trying after we mess something up! Well, when I finally got back to my food, the carrots were crisped, but the beef had a delicious smoked flavor – it was amazing! I arranged the short-rib bones on the bottom of my crock-pot so there was a fairly even surface across the top. I wanted to ensure that as the shank steak started to cook, it wouldn’t sag down to the base of the crock, gaining direct access to the heat. I want as much of the heat as possible to go in to the bones, causing them to crisp and release their smokey water vapor to slow-cook the beef in. On top of the bones, I spread the sliced ginger out, giving an even coverage. This is important. Ginger is an amazingly versatile spice, and can add some of the extra flavoring that you might normally expect from a smoked meat. It gives it some of that smokey flavor in the sharp spicy flavoring of the ginger. Also, it will help to retain some of the water content in the meat, so that it cooks off the water more slowly. On top of the ginger, I spread out one layer of the apples. As you can see from the picture, I’m not terribly concerned with the bone portion of the shank steak – it’s the meat that I want to ensure proper moisture to. In a smoke-house, this is done by adding water to the smoke, but in a crock-pot or slow-cooker, you don’t have the space to really play with the smoke. Or, at least, I don’t yet have the experience to design the cooking-process like that. Soon, though, I hope! Anyway, the apples helped a LOT! I added the coconut oil in two discreet gobs on each steak. Location, in this, is essential! I carefully placed the coconut oil where it is so that as it melted, it would have a lot of surfaces to work with before draining off the side of the beef. As I said: location is key. The more work it has to do to drain off the beef, the longer it will be there adding it’s flavor and moisture back in to the beef during the cooking process. I’m not making jerky here – so I don’t want my final product to be all dried out. I want it cooked, but smoked! Finally, the spicing. Using a pepper grinder, I applied a thick layer of pepper over everything. That black-pepper flavor is one of the key ingredients in replicating a smoked meat! I loved the final product. The beef was delicious, full of flavor, and moist enough to really enjoy! I haven’t decided yet if it was a good thing or a bad thing that it fell apart when I tried to take it out of the crock. I ended up pulling it mostly apart and serving it like a “Pulled Beef” dish. Perhaps the cut of beef is important here? But the flavor and texture were spot on, and it steamed away on my plate as I looked at it. There is definitely more work to be done. This, as much as I enjoyed both the process and the results, is definitely not a finished product. But I have succeeded in starting the process. And the final product, whenever I manage to get there, will be excellent!! There needs to be water in the process (somehow) for this to work. The success of this attempt notwithstanding, somehow I need to make something in the crock pot thoroughly crisp. And I have to select that something with care. I can’t wait to try again!!! Have any of you ever done anything like this? What are your results? Do you have suggestions on my process? How about flavoring? Which cuts of meat do you generally try to us? Does cut matter for the final product? I look forward to your responses! And I hope all of you go ahead and try something similar to this – it was an experience worth the effort! And the final product was definitely tasty! Thanks for the comment Josh. As I mentioned in the article, I stumbled on this totally by accident. And it’s been consuming me ever since! That first pork roast (http://urbanpaleochef.com/2013/03/06/slow-cooker-smoked-pork-roast/) slithered in to my brain, like only smoked meat can, and just marinated there, waiting to be tried again! I LOVE slowly stewed meat that starts shredding! Reminds me of the dishes my dad used to make me when I was little! I really need to pick up a crockpot and get crocking… Although, do you need to cook the meat shorter when it’s grass fed due to the fact that it’s a bit less fatty than NASTY grain fed meats? Gigi – what a great question! You definitely do need to approach grass-fed meat differently, because the macro nutrient content is drastically different. 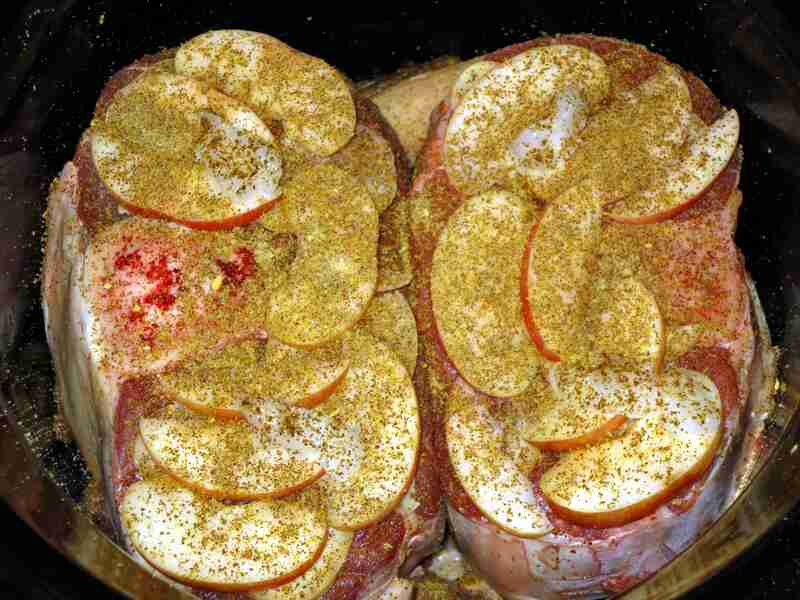 In this post for example: I put the ginger and apple slices on top of the meat, which will add additional moisture to the meat as it cooks, and helps to trap in some of the inherent moisture (both water based and fat based juices) inside the meat. Similarly, for stove-top cooking, I have found that I do a lot more cooking with a lid on my pans, since keeping the moisture of the meat in the cooking environment seems to make a really big difference in the end result! Alternately, I cook my meat with more vegetables in the pan, like carrots, celery, mushrooms and onions, so that the process can “borrow” from the veggies. Thanks for the question – it’s definitely an important consideration when using grass-fed meats! this looks fantastic! 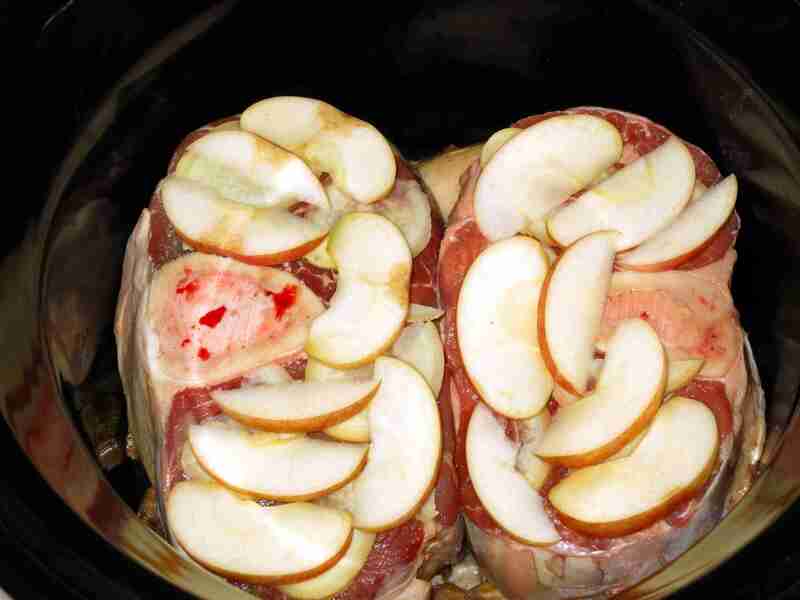 I’ve been wanting a meaty crock-pot recipe lately and this is perfect! any thoughts on what i could sub for apples to make it keto-carb friendly? As for the apples: I really wouldn’t worry about the approximately quarter-apple per half-pound serving of beef on a ketogenic diet. A quarter apple would come out to approximately 6 grams of carbs, if you ate the apple slices with the beef. If you use the apple, but don’t eat it with the beef, you’re likely to end up with maybe 2 grams of carbs per half-pound of beef from the apple juices. But, if you must substitute the apple… It would probably work if you put some carrot slices, or perhaps sweet potatoes. Neither has as much internal liquid to lend the beef during the cooking process. Which may work anyway, as they still help to keep the natural moisture in the beef. Ultimately, though, I don’t know yet… I’m still playing with the recipe! My pleasure! I’ll likely be trying them myself, eventually. But if you get to it first, let me know how it goes! I’m sure you can! 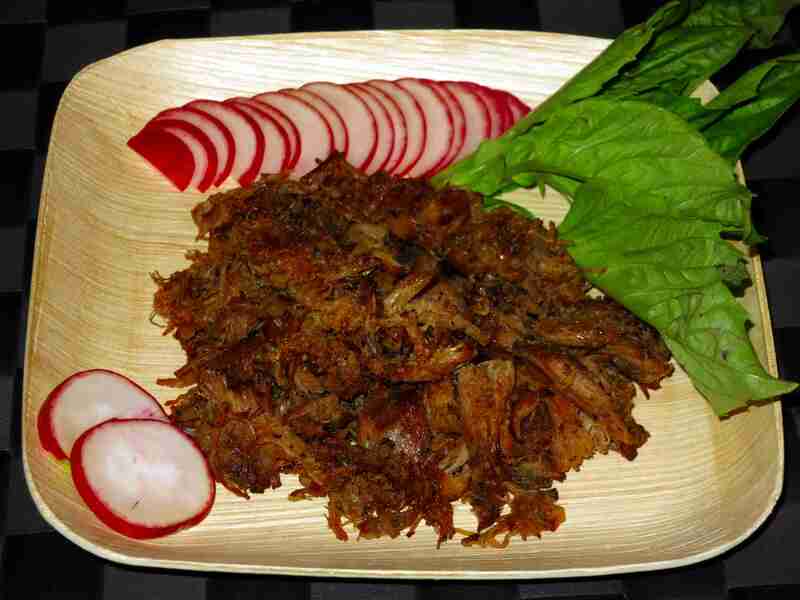 But just to make certain – I’ve continued to refine the final recipe. Keep tuned for updates as I finish them! ← Baked Maduros – A Sweet Treat!